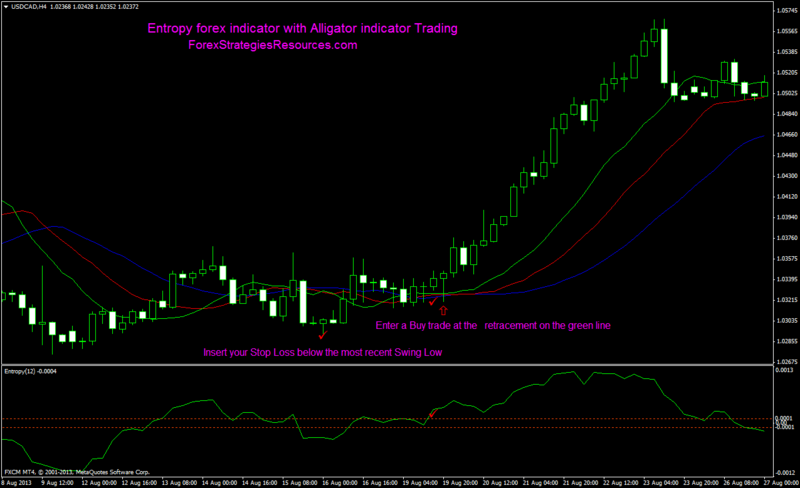 Alligator trend following forex strategy with Entropy. This trend following trading system, we have two indicators: Alligator indicator created by Bill Williams and Entropy indicator (created by Aleksandr Pak ) which is an indicator of market strength. 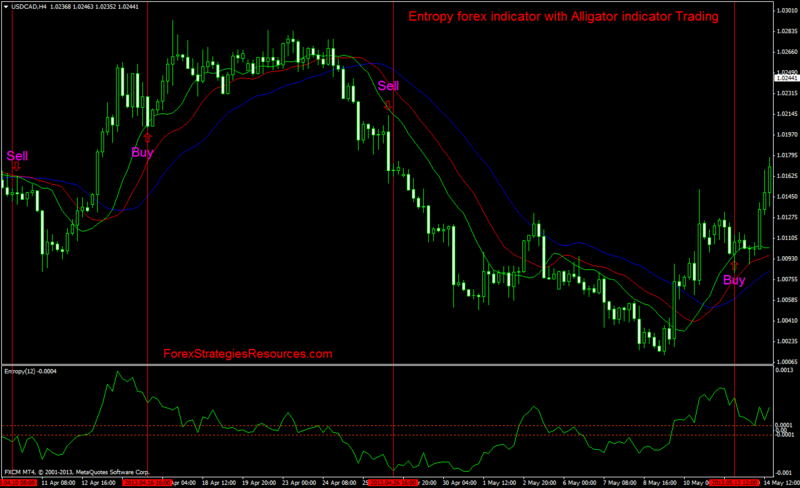 EntropyMath forex indicator (12 period with 0.001 Buy level and -0.001 Sell level). Condition: the candles are above the Alligator indicator. 1Wait for the Alligator Lip (green line) to cross above the Jaw (blue line). 2. Wait for the Alligator Teeth (red line ) to cross above the Jaw (blue line). 3. Wait for the Entropy math 12 to cross 0.001. 4. Enter a Buy trade at the retracement on the green line. Set your Take Profit the same number of pips away from your entry price as your Stop Loss, i.e. a 1:2 or greater Risk/Reward Ratio. Condition: the candles are below the Alligator indicator. 1Wait for the Alligator Lip (green line) to cross below the Jaw (blue line). 2. Wait for the Alligator Teeth (red line ) to cross below the Jaw (blue line). 3. Wait for theEntropy math 12 to cross 0.001. 4. Enter a Sell trade at the retracement on the green line. Set your Take Profit the same number of pips away from your entry price as your Stop Loss, i.e. a 1:2or greater Risk/Reward Ratio. 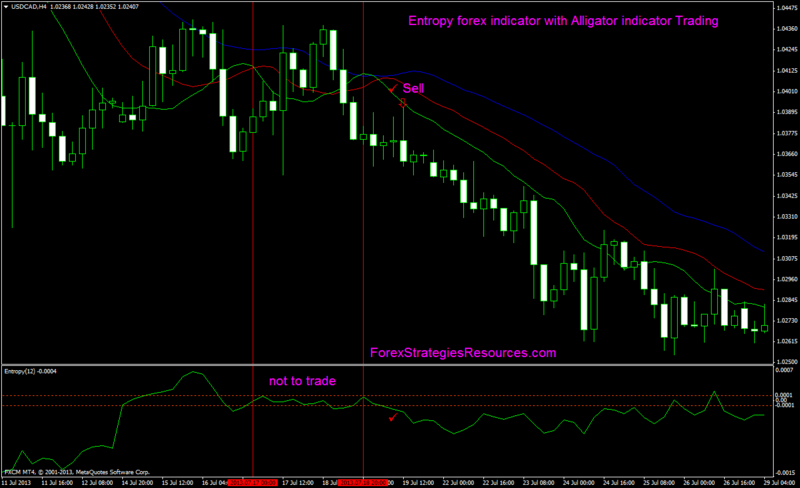 In the pictures below Entropy forex indicator with Alligator indicator Trading System in action.